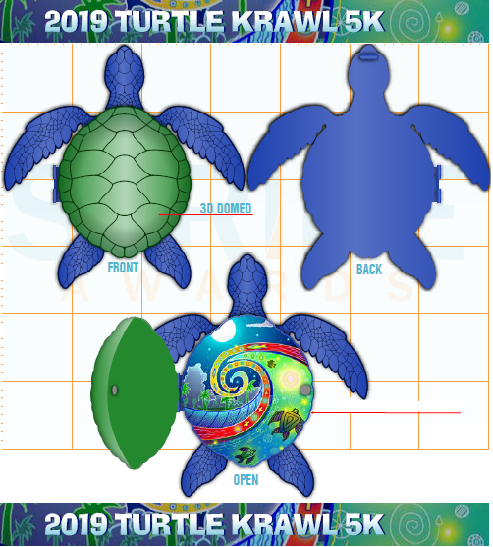 We are offering official Turtle Krawl Finisher Medals to anyone who registers online and is interested in purchasing one (while supplies last). Rather than raise the prices for all registrations and give finisher medals to everyone, we have decided to make finisher medals optional and available only to those participants who pre-order them. This policy ensures that all online participants have the opportunity to purchase one of these coveted souvenirs. The medals cost $17 each. This cost will be added to your registration fee. The Finisher medals will be included in the race packets and can be picked up at early packet pickup or before the race on race day. This year’s medal features a sea turtle shape with Nemo’s one-of-a-kind local artwork on the flip side. Note: The Finisher medals are the exact same medals our Award Winners except they have a different finish (the Award Winners have a gold finish).